Our Padauk Dimensional Lumber is cut to exact sizes lists. These pieces are NOT nominal widths. These pieces are S4S machined milled (surfaced on all 4 sides cut to width and length). The color of African Padauk wood is a vivid red orange that changes to bright red or coral pink over time. It has dark streaks running through the wood and the colour fades over time. Heartwood is white but also fades over time time to grey or brownish yellow with exposure to light. African Padauk ‘s grain varies from straight to interlocked. It has a medium texture with a natural sheen. The wood is heavy and dense. Its weathers well and polishes to an excellent finish. * African Padauk by the piece maybe sawn up to +/- 1/16″ of size listed. 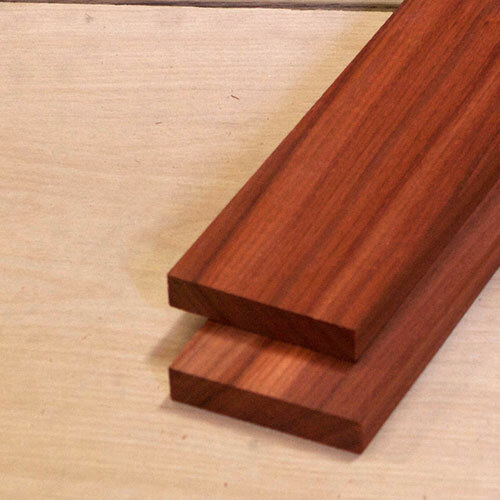 These African Padauk Dimensional Lumber pieces are solid hardwood. For specific requests please contact us. You can also place instructions in the order notes box at checkout. All orders will ship will 48hrs based on stock and availability. Beautiful wood! Sands to a smooth surface, takes an oil finish to make a beautiful finished piece.